Hong Kong has many things which make it unique, from locations to traditions to simple daily quirks observed in the street, with both Chinese and Western influences at work. One of its well-known events is the horse racing - the city has two tracks, where races are usually held twice a week through most of the year. Sha Tin hosts the day races, on weekends and holidays, but its Happy Valley on a Wednesday night that is the more popular choice for most people. It's one of these things I've been intending to do here forever, but only just got around to now! 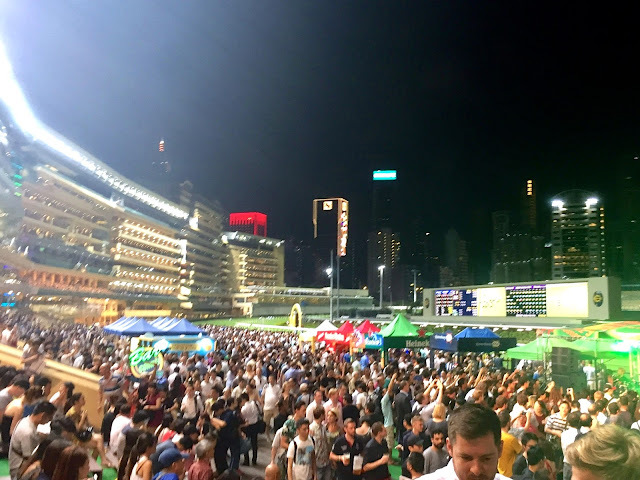 Horse race is not typically, but this is such a popular event here, and I thought it would be a fun one to tick off my HK bucket list. (NB: photo quality isn't the best, as I only had my phone and the zoom is rubbish). 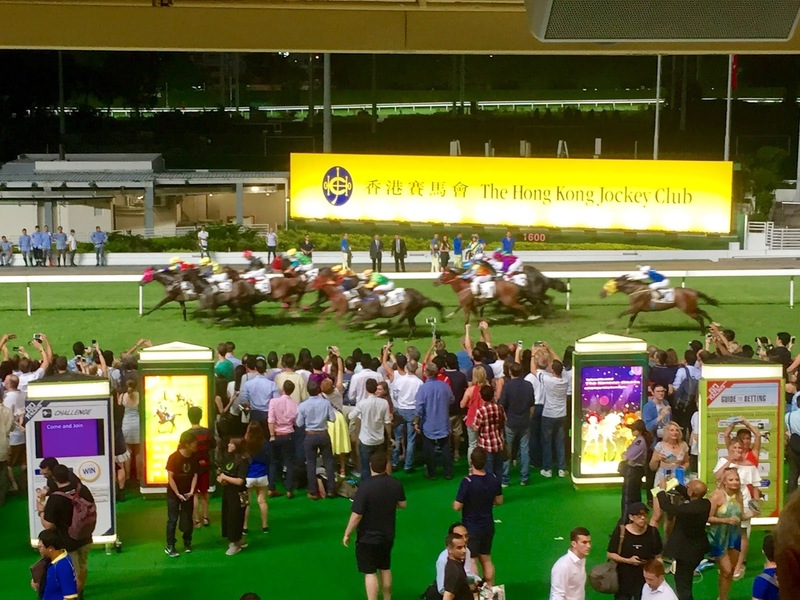 The track is easy to get to, just a 10-15 minute walk from Causeway Bay station, or take the tram to the terminus there. 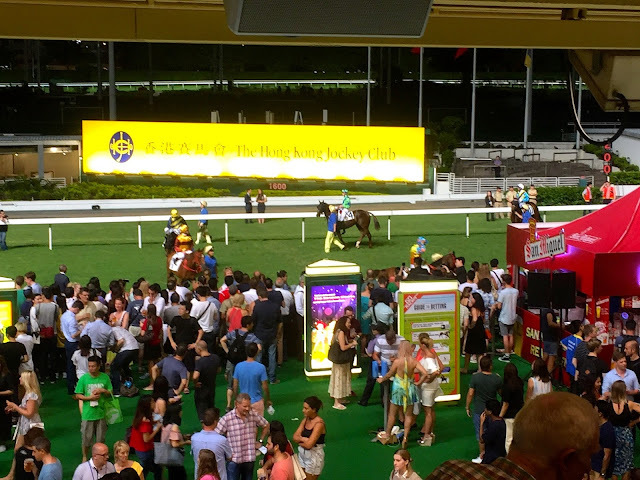 There is a fancy Jockey Club members area, raised high in the middle of the stands, complete with dress code, but we (like most others) were headed for the $10 public area. The stands only extend around side of the track, and the public section is the lower portion and the ground level around the edge of the track (as far as I could tell anyway). There's plenty of bars to choose from, of course, and even a McDonald's branch. The races typically start between 7.00-7.30pm, and last until somewhere around 10.30pm, depending on how many races there are (typically 8-10), but we arrived late and didn't stay util the end - it was still a work night! It took us a minute to get our bearings, as none of us had been before and the place was pretty busy. We headed in to one of the bars, not that far inside, as the promise of air conditioning was too good to resist in this humidity. As I say, we weren't having a big night, or a late one, but we were quickly lured into buying a jug of Pimm's between us, as it's bene forever since I had any, and it seemed appropriate for a summer evening at the races. 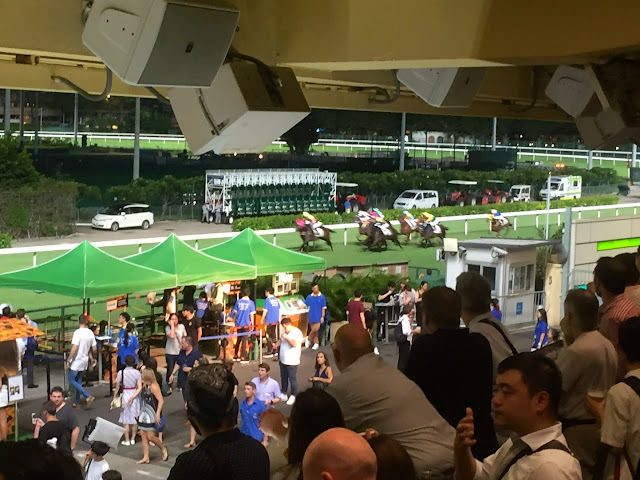 The bar had a balcony (part of the stands really) overlooking the track, where we settled ourselves for the rest of the night - it was humid, yes, and we had to stand, but it still served us fine, and we'd have been hard pressed to find a seat anywhere unless we'd arrived considerably earlier. It was also a great spot for people watching, as the crowds moved through the grounds below us. There were people of all nationalities there, but there certainly seemed to be more expats than locals as a whole. It was a little hard to read the screens from where we were, and I for one don't now enough about races to understand what all the figures mean - the other girls each placed a bet on the first race, though neither of them won, and we didn't bother again after that. I did enjoy reading the names of the horses, which are often highly amusing - Sight Seeing, Peace N Prosperity, Scarborough Fair, Clever Spirit, and Double Valentine were all fairly memorable choices. 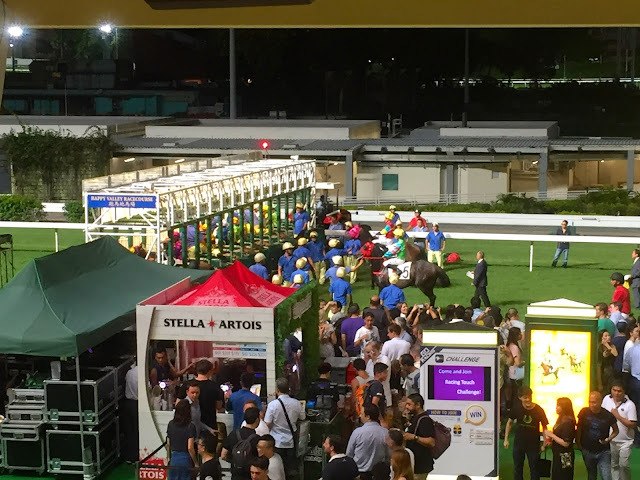 The first race started right next to us, so we watched them warming up and settling into the starting blocks - the other races started at different points around the track, so they had usually started before we even realised. 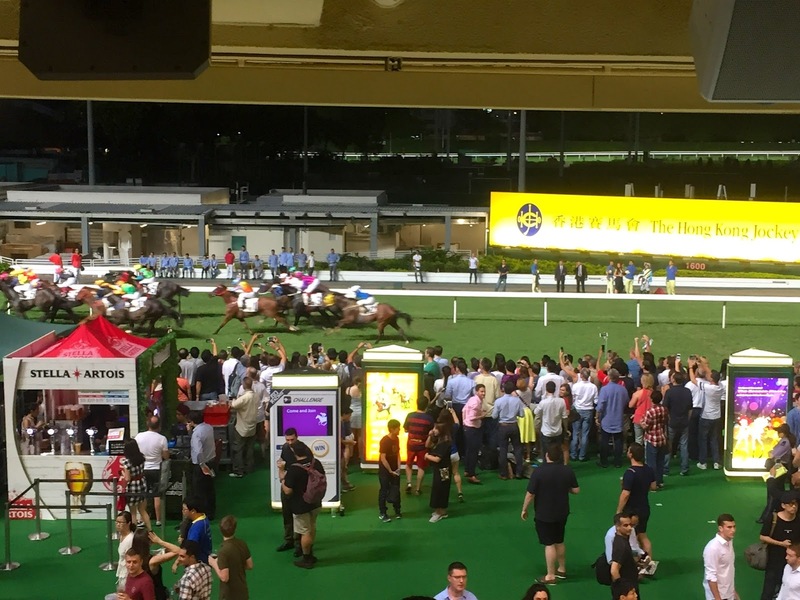 It was so fast, and as I say, the screens were hard to see, so I barely even registered which horse won each race, but it was still quite thrilling to watch them all streaking past us, with the stands roaring as people cheered on the horse they'd bet on. 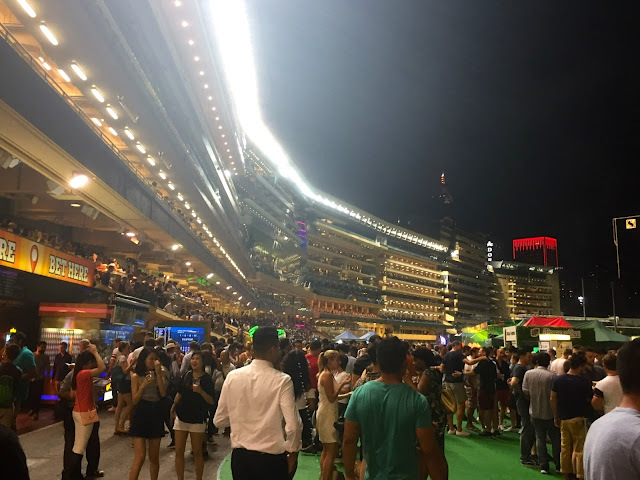 It was enjoyable, but we all agreed that if we'd been a little tipsier before arriving, and up for making a bigger night of it (without the burden of work the next day) then we'd have probably enjoyed it more. 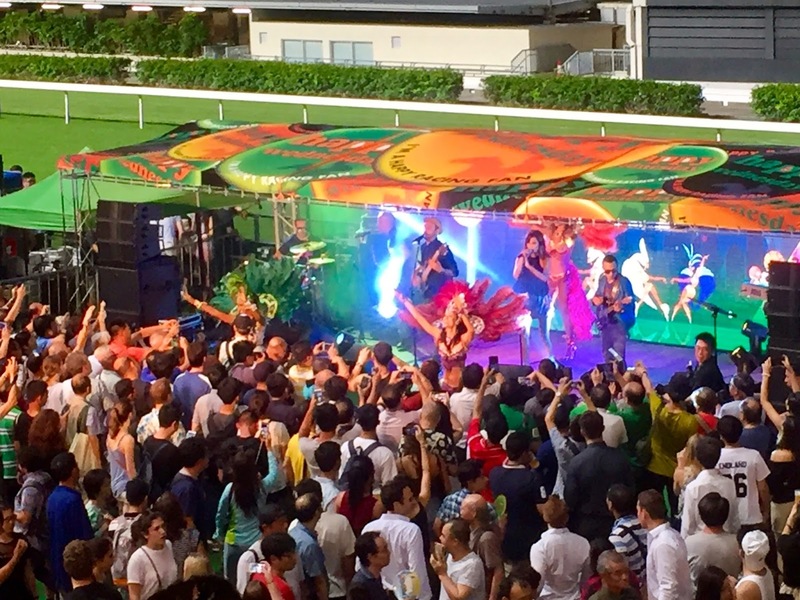 Happy Valley also has themed nights quite often - apparently Oktoberfest is a good time to go! - and through June they were having a summer carnival theme. In between each race, the band would perform - we could view the stage perfectly from our vantage point - a summery, Spanish, samba style song, accompanied by Brazilian samba dancers in their feathered costumes and head dresses, as if they'd dropped in straight from Rio carnival. Naturally, the crowd in front of them turned into a sea of phones when they appeared! 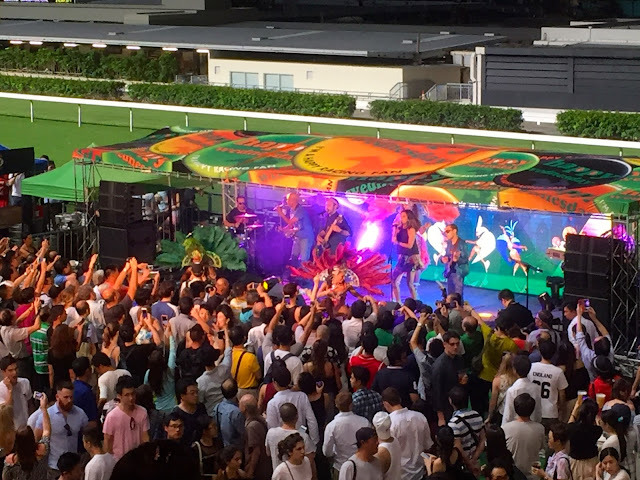 It was a fun addition to the evening, to entertain us between races, but they would only perform one song each time, and then we were still left with a good 20 minute wait before the next race. We would chat away during this time, and watch to see the names of the horses in the next race, but we all agreed it got a tad boring after while, not to mention we were very hot and knew we had work the next day. 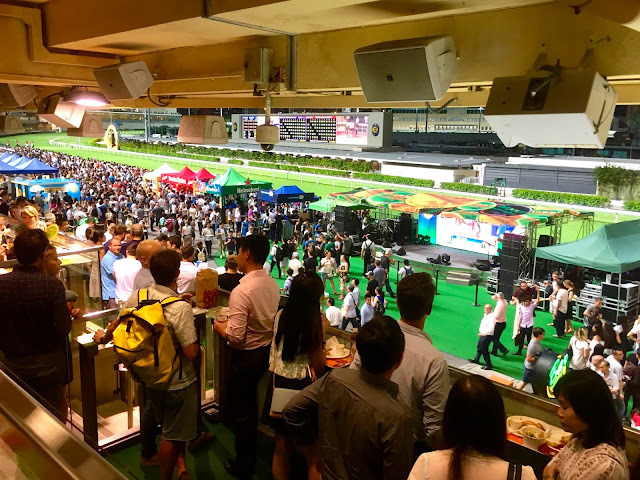 I'd definitely go back to Happy Valley if I were able to make a bigger night of it, if there were a public holiday or something the next day, and we could have a few more drinks, perhaps mingle a bit more, and even continue the night after the races were finished. It's tough to do much during the week, when we always have to be up early the next day, so I was glad to have gone out and done something for a change, but struggled to really make the most of it (I was also testing my students the next day, so absolutely didn't want to risk being hungover). So all in all, not my favourite thing ever in Hong Kong, but an enjoyable night, another things ticked off my list, and something I wouldn't be opposed to doing again, under the right circumstances.